Doctors can discover the medical benefits of photo sharing with the new mobile app Figure 1. 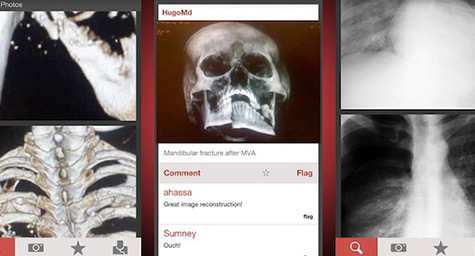 Hailed as an “Instagram for doctors,” the app allows healthcare professionals to upload and share a variety of medical images. This results in a vast database of socially crowdsourced medical content that provides doctors with greater access to medical knowledge and helps them better diagnose health conditions. PSFK.com posted details on how the app is putting a world of medical imagery in a doctor’s hands. Developed by healthcare startup Movable Science, Figure 1 is a photo-sharing app for healthcare professionals, which allows them to share medical images with the community while protecting the privacy of patients. The Figure 1 platform is similar to Instagram in the way it allows doctors to create their own feeds of images, yet it has elevated the concept from a form of entertainment to a means of education by providing a tool to help medical professionals share their knowledge and learn from colleagues in an engaging and enlightening manner. With the iOS app, doctors can upload photos illustrating medical conditions, surgical procedures, and other health-related information from their own practice cases and then share them with members of the community. The images can be tagged with relevant medical terms in order to help the community easily search for them and engage in meaningful discussions. Stars are used to mark higher-quality images and users can save useful images for later reference. Patient privacy remains a top priority, so the app uses facial recognition tools to block out faces and includes a consent form for patients. It also lets members add their own filters to hide identifying marks, as well as select which audiences are able to view their images before they upload them. Even though the app is aimed at healthcare professionals, anyone can download it for free from the App Store. Discover the latest in mobile applications for healthcare. Contact MDG Advertising today at 561-338-7797 or visit mdgadvertising.com.